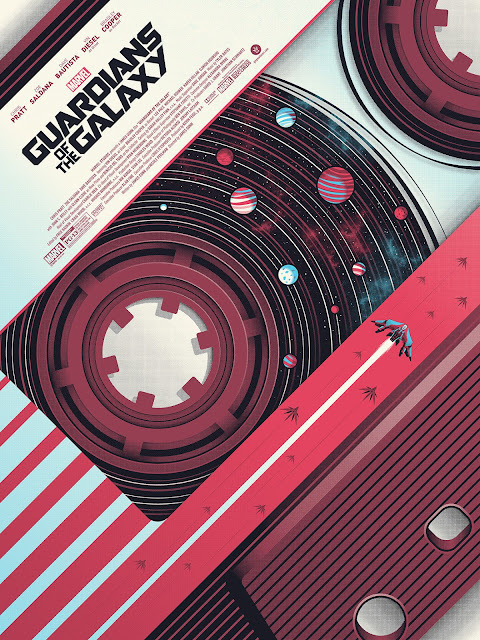 Tomorrow Bottleneck Gallery, in conjunction with Grey Matter Art and Marvel Studios, will be releasing a killer new Guardians of the Galaxy movie poster by Guillaume Morellec! The soundtrack to Guardians of the Galaxy is so vital to the film, and so phenomenal, that when BNG saw Guillaume’s concept of turning Star Lord’s Awesome Mix into the actual galaxy, they were ecstatic. The colors pop right off the screen print, and it’s the perfect piece to get everybody excited about the upcoming sequel, Guardians of the Galaxy Vol. 2! Guardians of the Galaxy by Guillaume Morellec is an 18”x24” hand numbered Marvel screen print. Limited to just 150 pieces, this print will go on sale at 12pm EST on Tuesday, February 21st, at the Bottleneck Gallery online store for just $40.